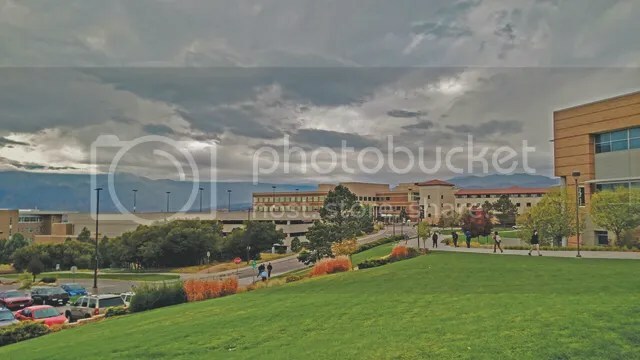 A fall storm approaches UCCS. With the changing seasons, it’s important to be prepared for any situation. Fall is here, and that means colder weather, such as what we have seen in the past week. But Colorado fall can also mean winter, because sometimes they blend into one season. Winter driving in Colorado – whether to campus, the store or to a friend’s house – can be a bit, or a lot, of a challenge. Make sure you leave with plenty of time to get wherever you’re going, there’s no need to speed or drive recklessly, which will probably lead to hydroplaning. You must go slower when conditions are not perfect. Go the speed you are comfortable with, or don’t go at all if you feel unsafe. Often, your professor will understand if you have to miss class because there’s too much snow. Most professors want you to be safe, rather than try to get to class at the risk of getting stuck. Just be sure to contact them to let them know you won’t be attending. Also, be aware that you may have to spend time outside of your car. It may be ideal to keep some personal protection gear in your car. Gloves, boots, a hat, and an extra jacket would complete your preparing. Take extra note of your surroundings in bad weather. Be hyper-aware of other cars. If you are involved in an accident during a snowstorm or any other time, remember to take those few moments to collect yourself and keep calm. Another precaution we need to take is to have a winter kit in our car. Once you put it together, keep an eye on it and update as needed. With help from the Automobile Association website, here’s some items to make sure you have (or at least contemplate having) in your car for winter driving.